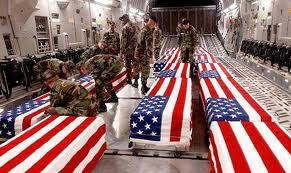 Yesterday saw 7 US troops killed in Afghanistan which follows 3 British troops killed 5 days ago. Two US soldiers were killed by an Afghan soldier and the rest appear to have been killed by land-mines/roadside bombs. There seems like no end to the Afghan war despite the casualty list on the ‘allied’ side in 2013 set to be the lowest since 2004. It’s not always easy to to know the impact of such deaths on the general public of the US and UK but their respective electorate must be getting fed up of seeing ‘their boys’ returning in flag-laden coffins. Spot on casualty figures are hard (impossible) to get especially if you try to take into account the civilian casualties of war. Costs of War put the current civilian casualty list at somewhere below 20,000 (that’s from start to now, 2001-2013). However the Guardian reckon up to 20,000 could have been killed just in the first 4 months! According to iCasualties so far there have been 2215 US military fatalities, 444 UK military fatalities and 640 other military fatalities. As the war continues, so do the fatalities. This entry was posted in Afghanistan, Anti-War, Daily headlines, UK, USA and tagged Afghan war, casualties, casualty list, current-events, fatalities, killed, Middle-East, Military, news, Operation Enduring Freedom, politics, soldiers, troops, UK, US on 05/05/2013 by Leon J Williams.